Remember the X-ray specs of science fiction comics that would let people see through walls and clothing? Full-body scanners are a bit like them. The scanners take advantage of the fact that at certain wavelengths, electromagnetic waves can pass through clothes but not through the skin, metal or substances such as drugs and explosives. If your eyes were sensitive to these wavelengths like the scanners, every person you meet would appear naked, with pens, coins, belt buckles and the like magically festooned about their person. You would also be able to see if they were carrying a knife, gun or explosives. What are the health concerns surrounding them? 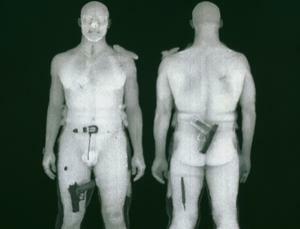 There are two main types of full-body scanner. One uses X-rays while the other uses lower-energy millimetre wavelengths. X-rays are hazardous because their photons have enough energy to ionise atoms and break chemical bonds. That can cause damage to DNA that subsequently leads to cancer. The machines are deemed safe because the total dose that someone receives during a scan is tiny. However, earlier this year, a group of scientists at the University of California, San Francisco, raised a number of concerns over X-ray scanners. They said the X-rays they use are low energy to ensure they bounce only off skin rather than passing through the body, to produce an image focused on objects concealed beneath clothes. This means that the entire dose that the person being scanned receives is concentrated on the skin rather than spread throughout their body. That could mean the skin receives a dose that is one or two orders of magnitude more than expected. To many observers, the response of the US Food and Drug Administration failed to properly address these concerns. Are there health concerns surrounding millimetre-wave scanners? While terahertz full-body scanners are not yet widely used, the work does show that the effects of electromagnetic waves on DNA are not fully understood. Are there alternatives to full-body scanners? Travellers can opt out of being scanned and choose to be frisked instead. The US Transportation Security Administration admits that the scanners have the ability to store and print images. But it says this capability is used only when the machines are tested and is switched off at all other times. Critics point out that it isn't clear how difficult it is to reactivate this capability or how the TSA prevents employees from recording the images with another device such as a cellphone camera. Hundreds of images taken by a body scanner and used by marshals at a courthouse in Florida appeared on the internet. The TSA says it would be impossible for a similar leak to occur from airport scanners. It's fair to say the public is yet to be reassured.